Kell Brook survived the first crisis of his career in Sheffield to cling on to his unbeaten record and take another step toward a world title shot. Once again looking to impress in his hometown at the Motorpoint Arena, Brook was also under pressure to deliver against a dangerous but low-profile opponent in American Carson Jones. Both men knew the winner of this IBF welterweight eliminator would move to within one win of a challenge for the world crown and it was Brook who managed it, finishing the 12 rounds bloodied and tired, but ultimately victorious with a majority decision win as one judge had it a draw and the other two ruled 116-113 and 115-113 in his favour. Brook, 26, came into the fight largely expected to extend his perfect 27-0 (18KOs) record against a man who has suffered eight defeats over the years. Yet Jones (34-8-2, 24KO wins, 8KO losses) boasted a higher IBF ranking - third, compared to Brook in fifth - and had won his last eight all by stoppage. Brook boxed nicely off the back foot early on, testing the water with occasional right hands. Brook was boxing beautifully and a double left-right combination in the third, followed by an overhand right, were classy. A Jones uppercut on the ropes quickly dissuaded him, however. Brook switched to southpaw in Jones' corner in the fifth and landed a nice right uppercut on the ropes, before stepping things up with two superb right hands. Jones looked troubled for the first time as the crowd got to their feet, but still the local man remained patient as Jones saw out the round. Brook got a taste of Jones' reputed power in the sixth. After having the American in bother with three left-right combinations, he allowed his man back into it as Jones threw shots back before landing an excellent right as Brook stepped back and followed it with some steady work to the body. The man nicknamed 'Special K' was taking more shots than in the first five rounds and looked untidy in the seventh round. Jones badly bloodied Brook's nose in the eighth with what appeared to be a short right and Brook faced the biggest crisis of his largely comfortable career. A right hand-left uppercut was nice work by Brook, but a right from Jones seconds later thudded home. The action swung the other way as the round ended with Brook landing a sublime right uppercut and left hook. Blood was streaming down Brook's face as he tried to stay out of harm's way and he was grateful for the bell to end the ninth. Both men landed lefts and Brook roared forward to have the fans on their feet again. Jones hurt Brook with an uppercut in reply, and if anything he looked the more dangerous of the two as he won the 10th. Brook looked ragged, landing a good right to the top of the head but being caught on the way out. 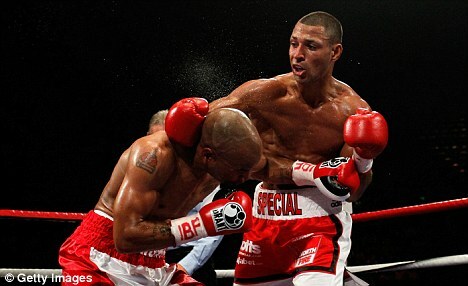 In the 12th round Brook sucked up a hard right to the side of the head and fired back while Jones kept coming forwards and landed a series of spiteful close-range shots. Brook saw the final bell, though, and after a few anxious moments the win was his, with Manfred Kuechler judging it a draw but his colleagues Steve Gray and Paul Barry favouring Brook.